It was one year ago today that we lost our beloved cat Molly. Molly was a special cat to me. I found her in 1999 under a car at our condo complex in New Jersey. It was a damp, foggy October evening. I put my hand our and she came right over. She was barely five weeks old! As she grew, the bond between Molly and myself got stronger. She was particularly attached to me. Although she was not friendly to other people, she provided me with constant companionship. She would follow me around, sit on my lap in the evening, snuggle next to me at night, sprawl out on the deck with me during the summer months. She was with us through three moves. Ridgefield Park, New Jersey, Edgewater, New Jersey and Rehoboth Beach, Delaware. 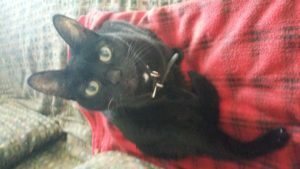 For almost nineteen years Molly provided me with unconditional love and comfort. About five years ago, Molly was diagnosed with advanced Kidney disease. I closely monitored her, made sure she took her medicine and ate properly. I purchasing a special oil from Canada with improved Kidney function. She survived for five years but eventually Kidney disease always wins. Our Molly passed away on February 3, 2018. She is always in our hearts and I believe that someday we will be again over the Rainbow Bridge and spend eternity in perfection together! Our 60’s and 70’s weekend continues on Edgewater Gold Radio! Ask Alexa to “play Edgewater Gold Radio” or listen from our website: Edgewtergoldradio.com. This entry was posted on Sunday, February 3rd, 2019 at 10:24 am	and is filed under Pet Supplies. You can follow any responses to this entry through the RSS 2.0 feed. Both comments and pings are currently closed.